Again, quite a bit of work - albeit largely invisible. 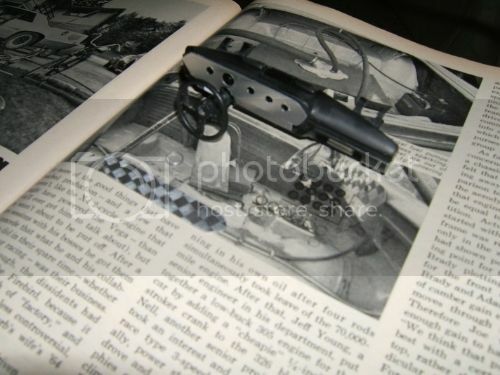 '71 Gray Ghost hood has been laboriously worked over to render its origins invisible - ha! The '64 GTO hood features twin faux hood scoops that had first to be ground down, and then attacked with a sanding block set on edge to comprehensively reduce the remaining 'hills' that formed the raised portion of each, blending the same to the surrounding panel work, etc. A vile task and not for the faint of heart. Other additions are new resin grilles (cleaner these, better shape, zero warpage, etc. ), a new coolant overflow bottle, and rough decal mock up work that, if nothing else, raises my spirits slightly. 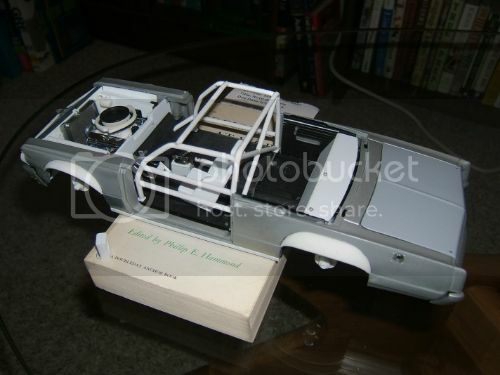 Mike, that '71 Gray Ghost model is really starting to look good. The hard work is paying off. Nice job! 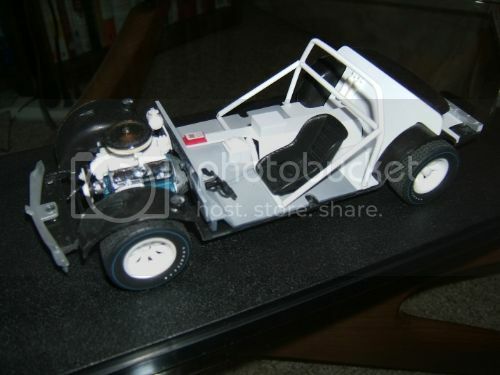 The Titus Firebird is looking a bit like some sort of sand buggy in that state. I'm looking forward to seeing that one take shape. Thanks for posting the updates. 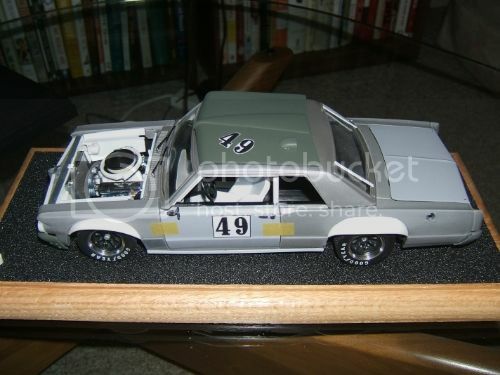 A more substantive update of the 1:18 Sun Star-based 1964 Pontiac Tempest/1971 SCCA Trans-Am season Gray Ghost this time ‘round. 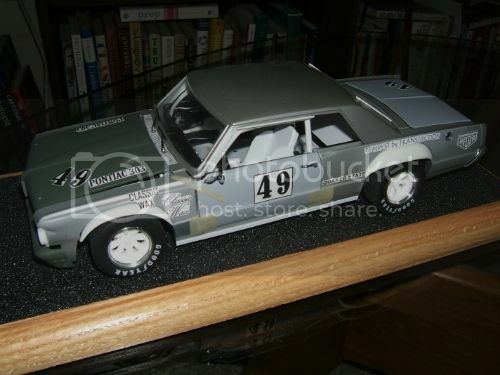 Glacial pace, yes – but hey – this isn’t just a few parts added plus livery. Here a complete roll cage has been fabricated, though fairly simple of shape as can be noted. An odd design to the extent that no tubes extend rearward past the main hoop. 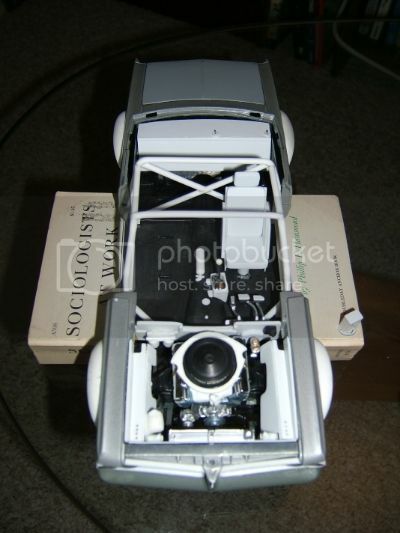 For careful inspection one might also discern that a rear package shelf has been added complete with shoulder harness pick up points (two), the interior trim panels have been substantially trimmed and narrowed (i.e. 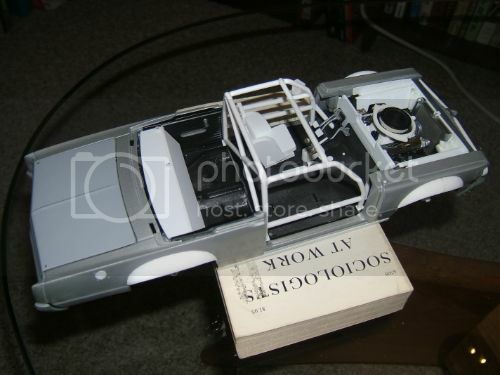 necessary to afford clearance for the extent of the roll cage, whereas the dashboard still requires fitting), while GMP Trans-Am Camaro disc brakes have been added complete with dust cap (1:25 oil breathers) and axle end detail (GM-specific and scratch built). Looking a bit meek in the style of early spot/single piston caliper/solid discs, I’ve doubled them up (these having been reproduced in resin) and hope soon to add ventilation detail for use of a tiny rectangular section file. Proper caliper mounts and calipers to come. Track has been increased front and rear for adjustment facilitated for the redesign of how everything is mounted. A 1:18 Lane B.O.P. (Buick/Oldsmobile/Pontiac) differential housing is poised to be clayed up in anticipation of fitting the same to the chassis. At this point precious little has been done underneath but for a fuel cell housing, hence much to do there. The bend upward of the cross bar situated just back of the front windshield is reproduced in a manner slightly less pronounced than what is seen on the 1:1 ‘Ghost, although this reflects the fact that I’m working with plastic castings versus scale-thinness stampings and such must be accommodated. Given that the roof must be slightly smashed down even absent the roll cage to properly fit into place along the firewall, know that the dimensions tighten up further when modest pressure is applied forward. The bars penetrating the floorboards forward will eventually be mated to the frame members consistent with tying the structure together entire. Know too that the shifter housing/platform is indeed offset a bit if not bent a bit (versus prim and mounted strictly straight) on the 1:1 racer, the pedal configuration isn’t final, whereas the seat rails/mount hasn’t yet been fabricated (this being a mock up). Much floor work – especially looking behind the main roll hoop, remains to be done. All-but-invisible is a new scratch built dual oil filter remote mount situated on the firewall (fifteen parts in total), an odd wet sump oil pan reflecting the choice by Team Trans-Action to recycle select T-G Firebird team parts (here a design used to accommodate 180 degree headers tested in ‘70), as well as revisions done to the fuel cell and fuel delivery system categorically unseen in the trunk. 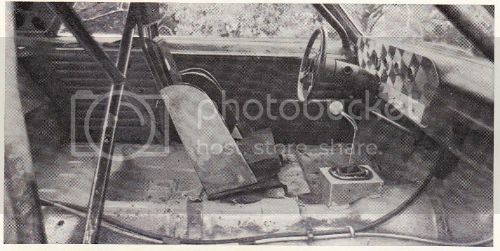 The seat headrest is now sited with brass rod, while all I had to go on with regards to the configuration of the same is the old Motor Trend image roughly suggesting such. Lastly, the beginnings of a large Harrison oil cooler to replace the somewhat mousey original GMP Trans-Am Camaro rendition of the same may be viewed resting apart from the model in some photos. Top and bottom detail needs to be added, whereas the flange/mounting detail is an easy matter to create and yet isn’t present within photos. Nice work, Mike. I like that miniature Harrison oil cooler. 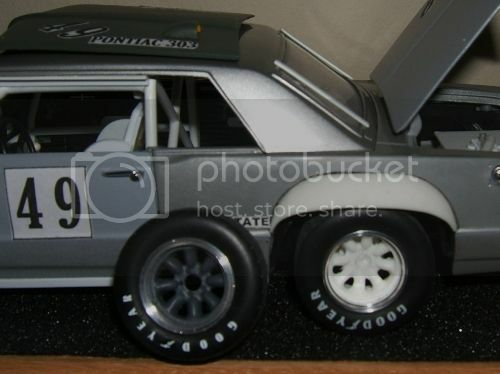 I am stunned and never picked up on the fact that there are no rearward support bars for the roll cage on that car. Very surprising. Indeed - an odd cage configuration. Perhaps Donohue's mulling about how it would seem a torsionally flexible chassis can perform wonders in the rain (and as mentioned within the space of The Unfair Advantage) is rooted in a faint remembrance of this effort? Looking good, Mike. How are you planning to replicate the unique pattern on the metal dash face? Some items on the model will be used to form patterns on other material prior to finishing and fitting the same, with the dash cluster chief among these. I'm hoping to cut or trim some reasonably thin hobby aluminum sheet for the cluster overlay, while for carefully drawing out the checkered pattern and further consultation with regards to photos, mask out and paint over the resultant panel with some appropriately frosted aluminum shade. It's nice to finally focus on smaller matters versus endlessly mulling how I'll not be able to achieve some satisfying final result without the right rolling stock, the right flare contour reproduction or an appropriately fitted cage. Although perhaps to be followed up upon with a neat story/photo feature, a fun local discovery was made in relation to the G.G. days ago. There exist various local sites that have historical interest to the vintage SCCA Trans-Am crowd here across SE Michigan, whereas the most well known might be the original buildings that constitute the Kar Kraft facilities in nearby Brighton, MI. Of course, if one is sensitive to where the factory Trans-Am Mustangs were first fabricated, this is an important site and worthy of a pilgrimage if you will. 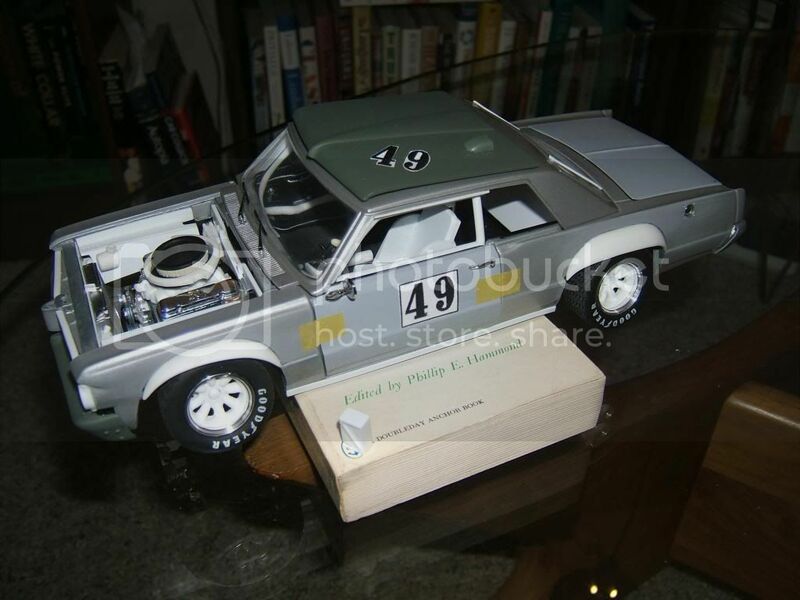 Anyhow, some curiosity existed within myself to seek out the residential property depicted in the period Motor Trend article where the Gray Ghost is being serviced/overhauled between race dates. Just some suburban split-level in the middle of who knows where, children's bikes scattered about on the lawn up front, etc., while in total the very epitome of a low-buck effort/factory engineers on holiday. Perhaps not the gates of Ferrari in Modena this, but given what I'm doing, significant enough. Ownership of the topic on the part of this enthusiast? Check! Just amazing work, Mike. Can't wait to see how it turns out. Thanks for the update. 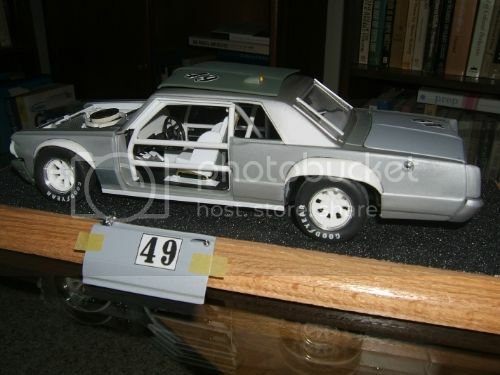 A unappealing fact one encounters for converting a stock production diecast model into an stripped down production-based racer is the oftentimes less than appealing surface contours left behind for cutting out panel work and trim. What seems to be developing into a fair scale replica takes a step back for revealing the origins of this material and that manufacturing process. The most basic modification will surely include the fabrication of the rear bulkhead and the roll cage, but here I try to add a bit of interest to the floor contour proper. 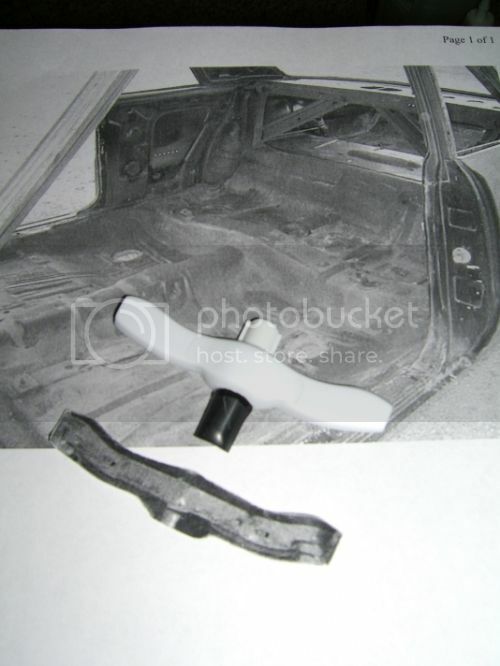 Smaller additions in the form of half-round stock laid laterally across the driveshaft tunnel as well as drain plug holes and stiffening indentations might also be tried. Mike, from my novice perspective I thought the replication of the dash and the rear floor area were going to be some of the harder things to pull off, but you have made it look easy. Another evolution/iteration of the instrument cluster for essentially starting again with a new panel is seen below, whereas scale Dymo labels as well as turned aluminum toggle switches might further be added. Sorry for the fuzzy photo image - look away quickly lest a headache form! I like that dash a lot. Turned out nicely! It's starting to look like a complete car, Mike. You've made some great progress on it. Thanks Jon for the kind interest and especially the spread of recent Donohue Camaro images seen above! A considerable pet peeve harbored by this modifier is the reality of tire licensing deals that too often translate into period scale rubber bearing all too contemporary fonts. Firestone shod racers aren’t entirely immune, although in the case of many a Goodyear-shod racer, the too-visible-by-half lean to the right in particular undercuts whatever period-correct illusion one would otherwise clutch to. 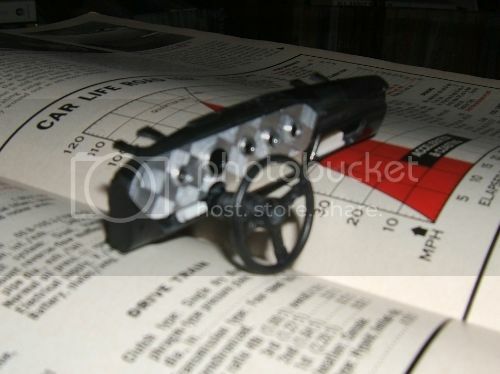 The Hall of Shame of those models plagued with somewhat silly footwear includes the Exoto Porsche 917’s, the 1:12th Minichamps Maserati Birdcage, while readers here could doubtlessly identify other egregious misfires of conception and execution. One could say much the same for 1:1 vintage racing topics besides, where old molds are reemployed to create new examples of old designs though the stark declarative sidewall lettering of days past somehow gets lost in the shuffle. Not good, and something that could be improved upon looking forward. 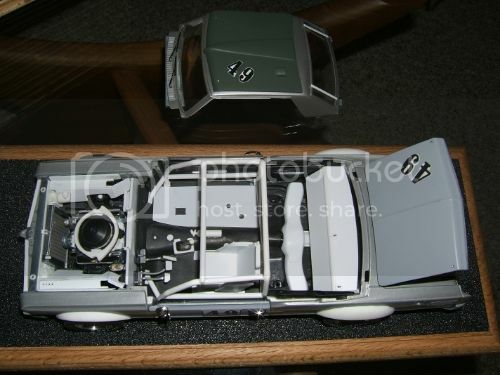 For the 1:18th Gray Ghost I’ve been clutching to a single photo depicting the vehicle on a trailer at Bryar, NH. in ’71 with the car wearing the larger declarative ‘T.V. tires’ more akin to what had become de rigueur in Winston Cup/NASCAR circles. The car just looked so sinister, although in truth I hadn’t a single on-track shot of the car so-fitted with the larger-lettered Goodyear Blue Streak Sports Car Specials. In point of fact many races seem to show the car sans any sidewall identification – odd this. Returning then to the topic of scale Blue Streaks, the blue ring tires pretty much vanished from the tracks late the season the year before, although smaller lettering was long a feature of Goodyear road racing rubber; i.e. people know and expect to see it. Eventually the sidewall raise white letters seen on the Blue Streak Sports Car Specials had their aesthetic corollary in the ubiquitous Polyglas GT tires installed upon nearly every Detroit enthusiast vehicle of the period. In short, I can’t deny that the usual fitment on the Gray Ghost called out for the less prominent font, set straight and definitely less blue rings. Although not perfect, what is seen below constitutes a stab at a solution. 1:18th options for what I desire are scant, whereas negotiations with a prominent online supplier to revise and/or correct his product went nowhere. 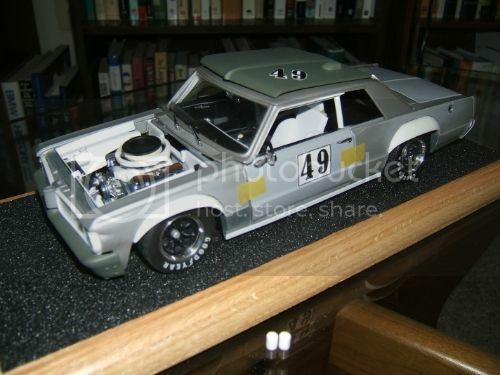 Anyhow, the experiment seen below was performed with a 1:25th Slixx drag racing tire decal set which includes rear slick sidewall tire manufacturer identification decals that are larger than the usual scale offerings. Too tightly spaced to really afford me what I want, each letter was cut out separately and positioned independently on this test tire positioned just to the left of rear wheel arch in the photo. And yes - I'm still torn as to whether I should apply the gray/violet barrier coat or a semi-gloss black finish to the wheels for this first-half of the season car. At present I'm thinking this will be a Bryar, NH entry. P.S. 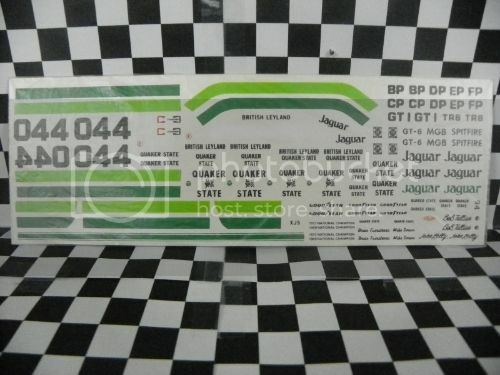 Apparently a 1:25th scale Fred Cady decal sheet for period Jaguar and British Leyland topics of note will supply the needed Quaker State script. 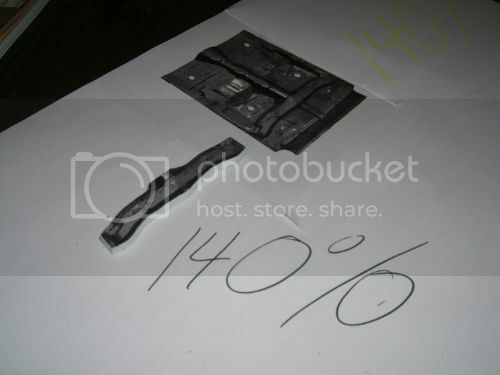 An old Quaker State flag decal image was also sourced for searching out and about and is also seen below. I wasn't having much fun in my quest to identify appropriately tall lettering, and here express relief that in sum such wasn't that hard to come up with. Three sizes to play with on the old Cady Designs sheet, whereas here and there one will still detect the care he exercised upon his products; i.e. the flag decal is pretty much a waste, albeit the stand alone lettering is quite good. 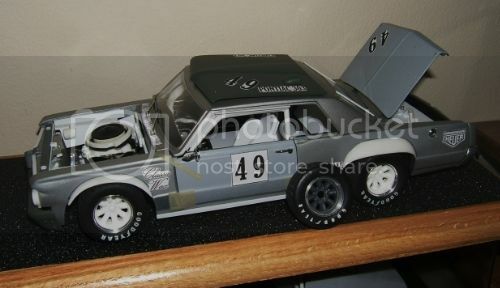 Many scale replicas of period racers fall down for rushing the accessory artwork; i.e. the stuff is poorly registered, off-color, and of incorrect scale. This project should be better in sum - thanks for reading! Mike, you keep going from one hurdle to the next. It's like watching a steeplechase. It looks like the decal sheet will be helpful to the cause. Kudos for finding it.